Pigs do fly - A1GP in Mexico cancelled and Spanish F1 GP on flu watch. The A1 GP series cancelled its final race of the 2008-09 season scheduled for Mexico on May 23-24, blaming the serious concentration of swine flu in that country and highlighting the advisory from the UK Foreign Office to cancel non-essential travel to the country. The tough decision came as the World Health Organisation raised its swine flu alert to a worrying phase five, with the WHO chief Margaret Chan foreshadowing an imminent pandemic following the outbreak. One step short of a full pandemic, phase five is a strong indicator that the time frame to put into place all the necessary mitigation measures is very short, according to the WHO. "To say we are disappointed to have to make this call is an understatement," said A1GP Chairman, Tony Teixeira. "When the news of the health problems broke last week we made sure we kept ourselves up to date with the latest information. It soon became obvious this was not an isolated health risk, and when the UK Foreign Office put out its advisory and the World Health Organization raised the level of influenza pandemic alert, that was when we had to make our decision. "We must have the safety of all members of the A1GP community as well as the thousands of loyal fans in Mexico City as our prime concern," he added. The A1GP cargo was due to be flown out to Mexico directly after the Brands Hatch race and so this was another factor in the decision. "If we had flown our cars out and not been able to send the teams to run them it would have been a waste of time and money. "This cancellation does not impact on the future of the series and once Brands Hatch is over we shall be concentrating on Season Five, for which plans are already well advanced," said Teixeira. The cancellation of the Mexican round means that this weekend's A1GP meeting at Brands Hatch becomes the final round of the championship. And the decider. Three teams - Switzerland, Ireland and Portugal - can take the crown. 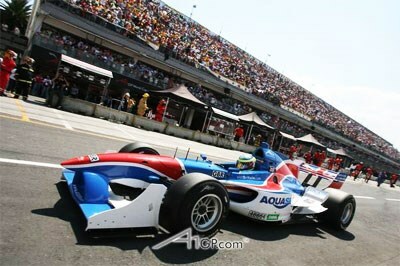 A1GP is the first major motor sporting fixture to be affected by the swine flu outbreak, but it may not be the last. It has been suggested that attendances at this weekend's Spanish Motorcycle Grand Prix at Jerez, which may normally attract a three-day total of 240,000, could be significantly reduced due to spectators' health fears. Formula One may also fall victim. Catalunya is the most infected swine flu region in Europe, and some are predicting that the Spanish Grand Prix in Barcelona on May 10 could be F1's first-ever spectator-free event. That possibility will sorely test Bernie Ecclestone's resolve. He's already concerned about the global economic situation. The circuit's website suggests that 60,000 tickets have been pre-sold. Gee, perhaps the health of the planet's inhabitants may even come before the health of Ecclestone's wallet.